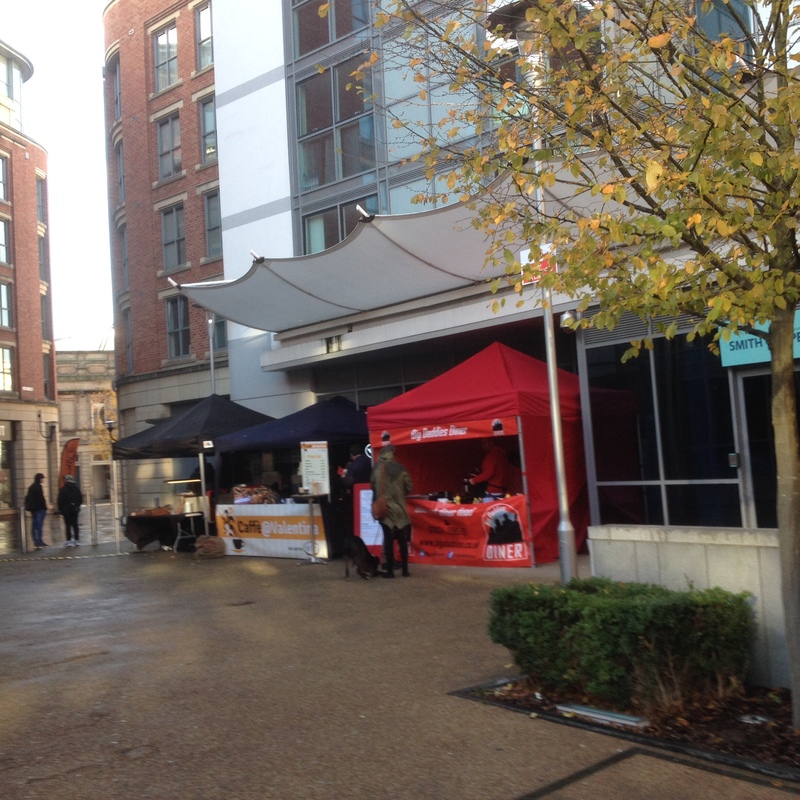 Over this last weekend we visited the Nottingham StrEAT market running over Friday-Sunday held in the Lace Market Square, just off Fletcher Gate near to the Lace Market Tram Stop. The event was being organized by Tiger Community Enterprises . The market was on all weekend, in the evening on Saturday they had a Streetfood Bistro Event which I went to as well (Read More Here). 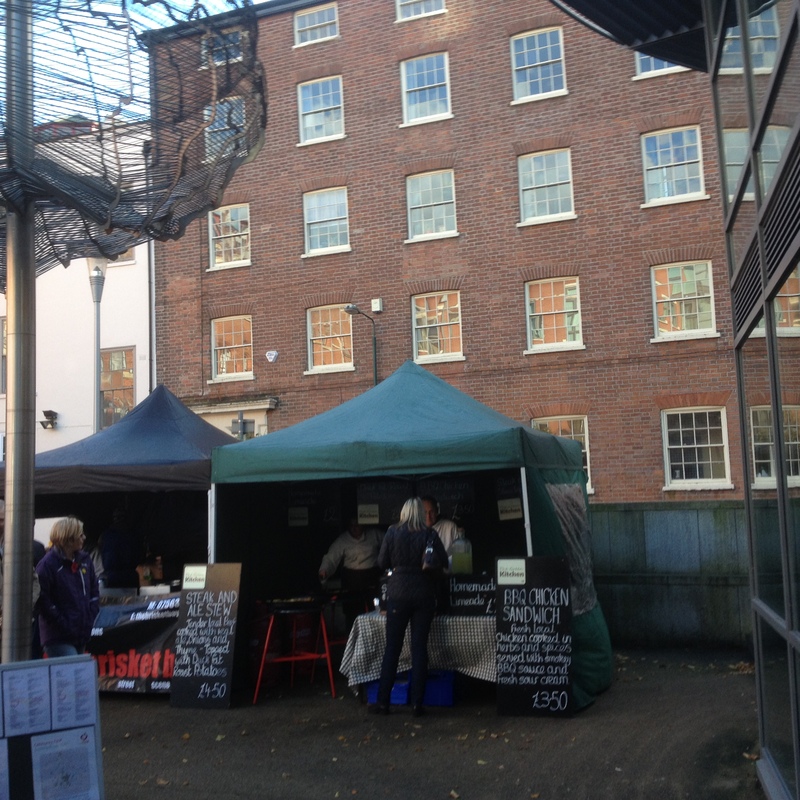 Even though I was saving myself for the offerings at the StrEAT bistro, I couldn’t resist walking through the market at lunch time just to see how it was going and well lets be honest pick up a little snack of some sort. The weather wasn’t that great and I think I was lucky as I passed through just as the rain paused for a moment, there was even some blue sky. Some familiar faces and old food friends were present at the market. 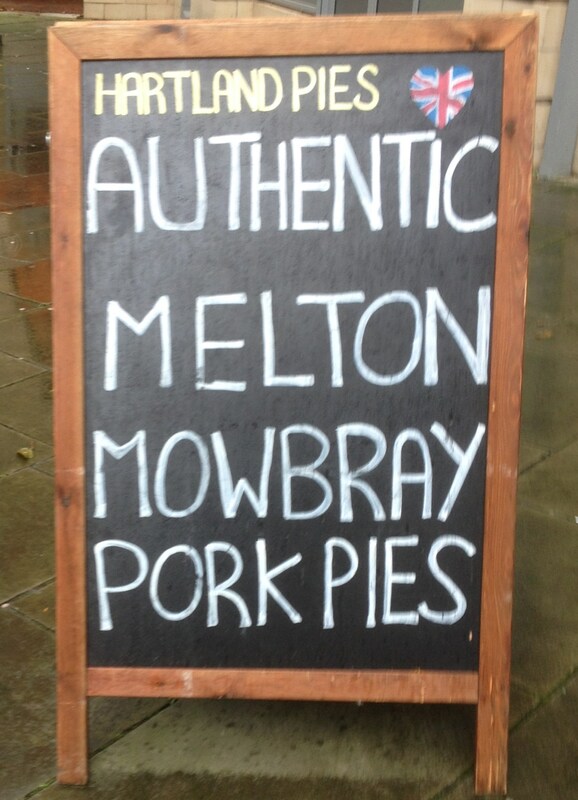 I was happy to see the Hartland Pies team there, they do serve excellent pies, my own personal favourite being the Pork and Chorizo pie. 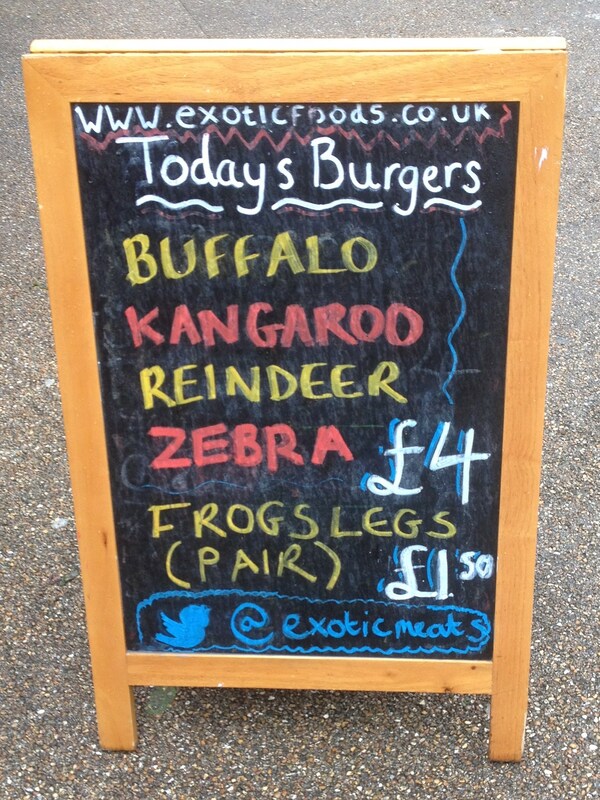 I almost took advantage of a pair of frogs legs for £1.50 from the ExoticFoods stall, but they didn’t have any on the go as I was passing by. 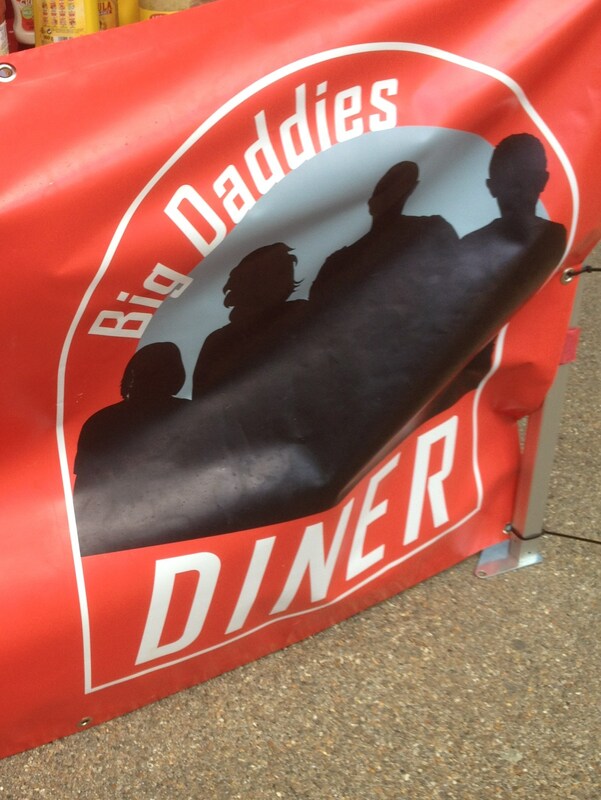 There were plenty of options but I had a hankering for a hot dog, or rather a bratwurst of some sort, and I knew that I would be able to locate such a thing at the Big Daddies Diner stall. Prior to the event I had a little tweet with this team as they were telling us what they had on offer. I approached the stall and it came down to a choice of two dogs that were sizzling away on the hot plate. 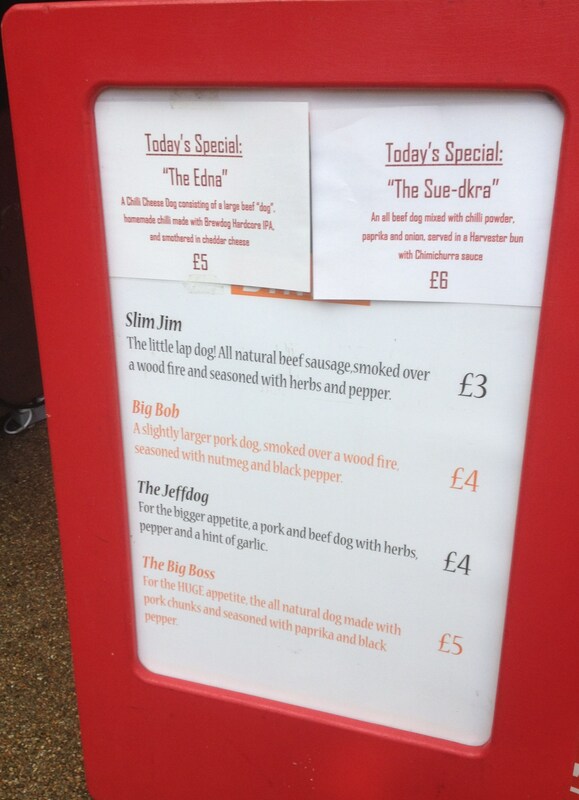 The “Big Bob” which is “A slightly larger pork dog, smoked over a wood fire, seasoned with nutmeg and black pepper”, or “The Jeff Dog” cited to be “for the bigger appetite, a pork and beef dog with herbs, pepper and a hint of garlic“. 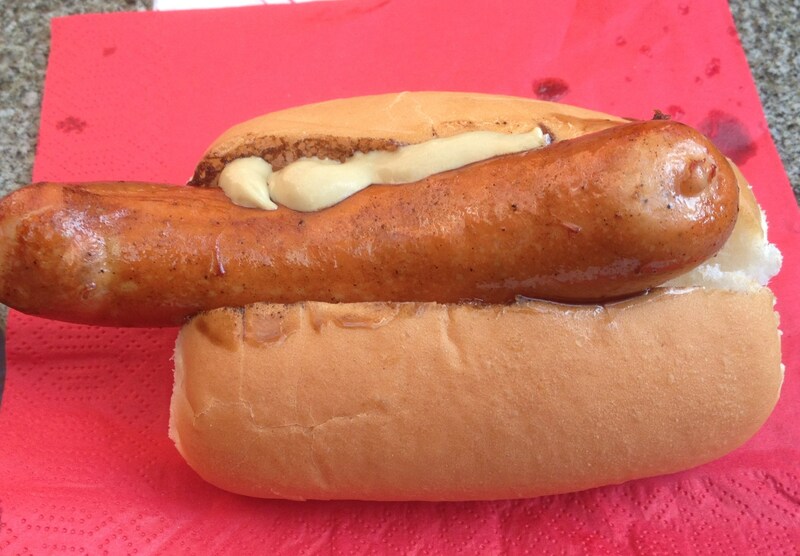 I took advantage of the Jeff Dog and it was a good solid hot dog, the casing had a good snap and the filling was well seasoned and flavoured, it was pretty juicy as well verging on the edge of watery but that was OK. I have to say it Big Bob does a good Dog. I wasn’t the only one to think so, I have seen some twitter compliments on the airwaves since as well. 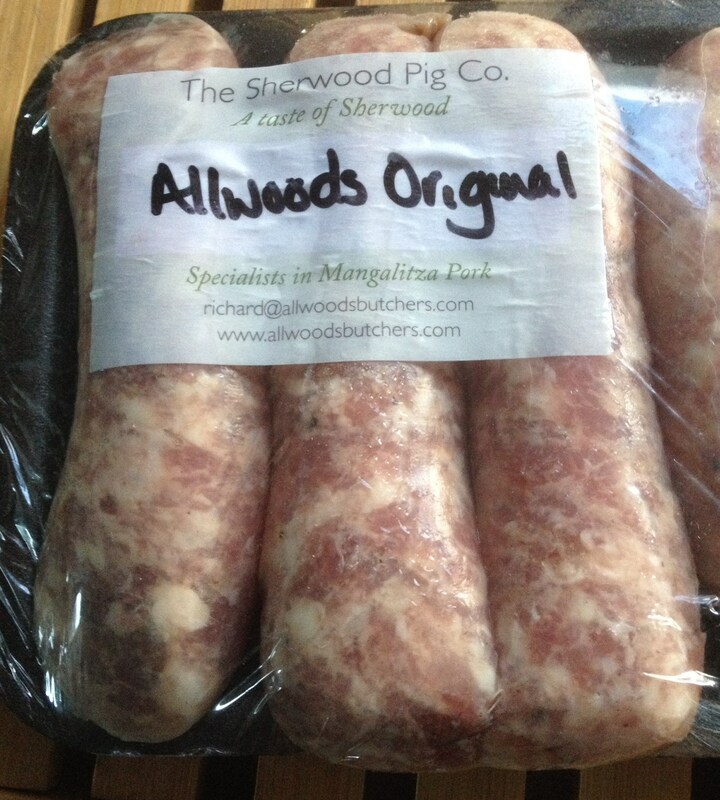 We were continuing the encased meats theme at The Sherwood Pig Company stall with Allwood & Son’s where we were moving along the genre from dog to sausage. We bought some of their sausages and also received some in our goodie bag that we got at the StrEAT bistro (a definite unexpected bonus). 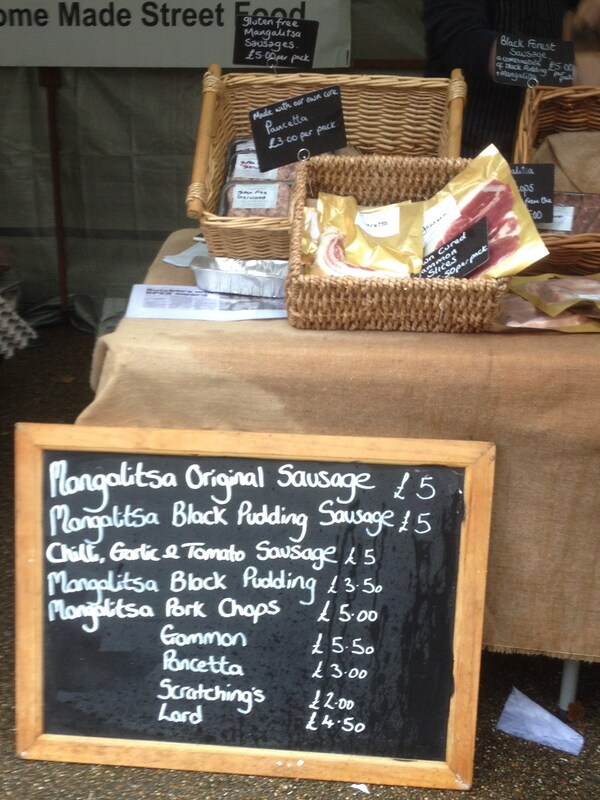 One of their featured items are the special Mangalitsa sausage made from a rare breed of pork bred locally within Ollerton. The lad and lass on the stall explained that it was from pigs that are supposed to be the closest descendant to the wild boar that used to roam Sherwood Forest. Sounds good to me. I am always looking for some proper sausages, that have not been messed up with all those flavor combinations like pickle and goat, or camel and cranberry, you know what I mean. 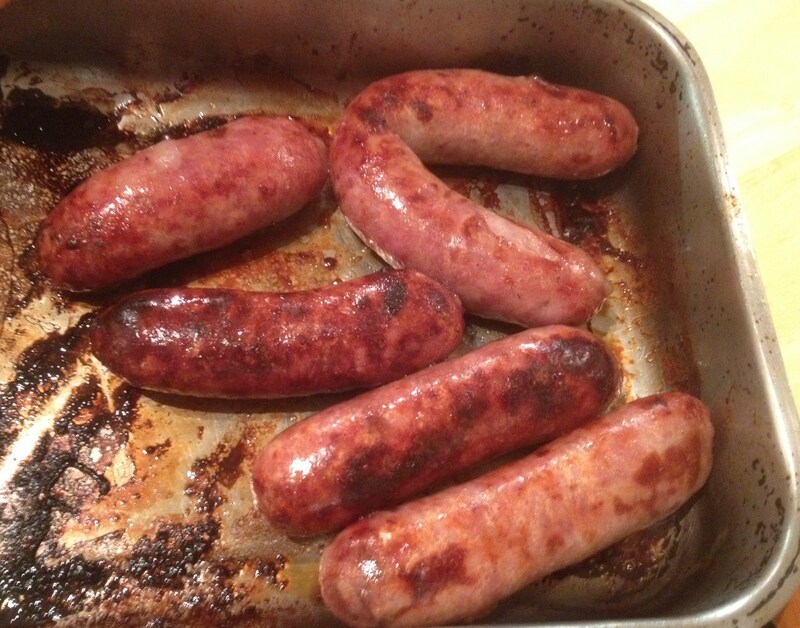 These Allwoods sausages fitted the brief, excellent simple taste, well flavoured and simply seasoned. The mangalitsa pork meat is supposed to be a little bit fattier than some pork meats, but they told us that it then has a creamier taste. It was jolly good that is all I have to add. I have also heard that the pork is so sought after that there is a waiting list. I am not going to tell you where that list is until I get my name onto it. 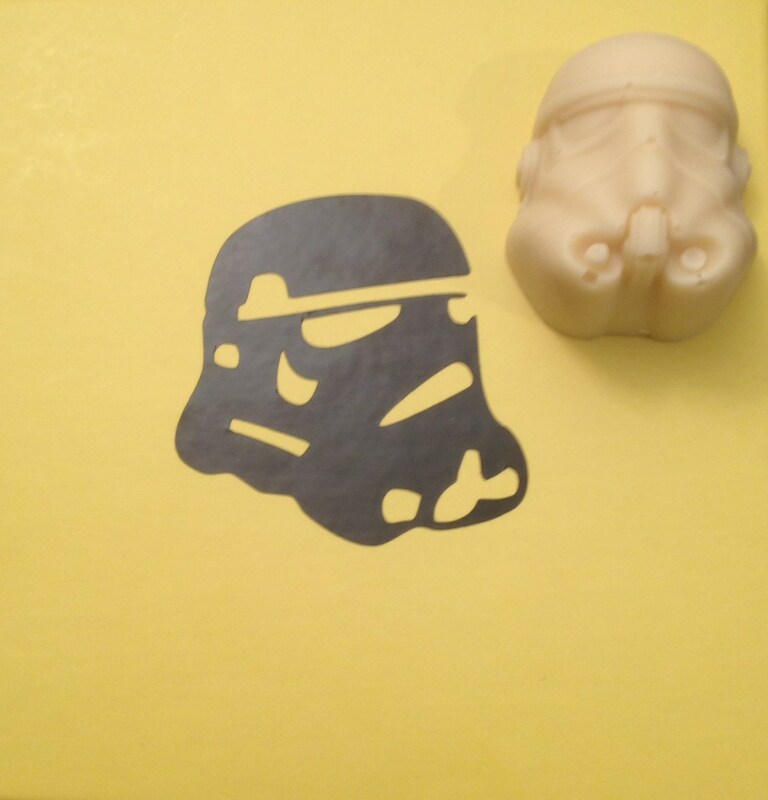 On big surprise came in the goodie bag that I picked up at the bistro event when I found some Star Wars or more precisely StormTrooper Chocolates from the Deli-Cious stall. I did see the stall during the event, but I was not at my best to talk to the Chocolatier Lisa, as I was chomping down on my hot dog as I passed. 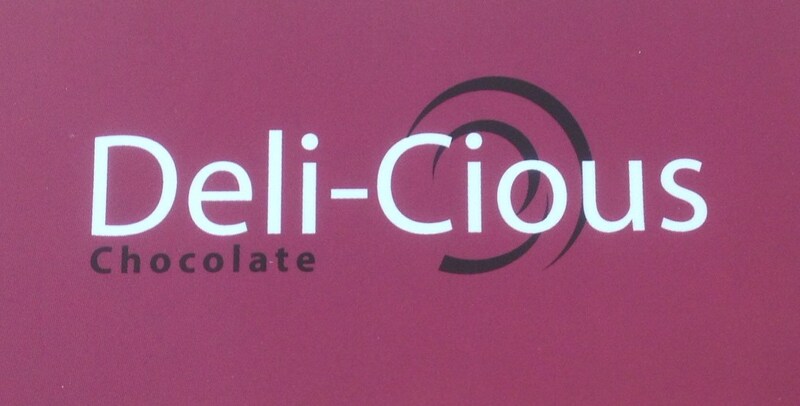 I was however delighted to receive these chocolates. There were lots of food stalls at the market, and if I didn’t hit them up this time I will try them on another day, perhaps you will get there before me and if you do tweet me @myfoodhunt with your recommendations and stories. If you fancy doing a review then send me a line at myfoodhunt@aol.com. 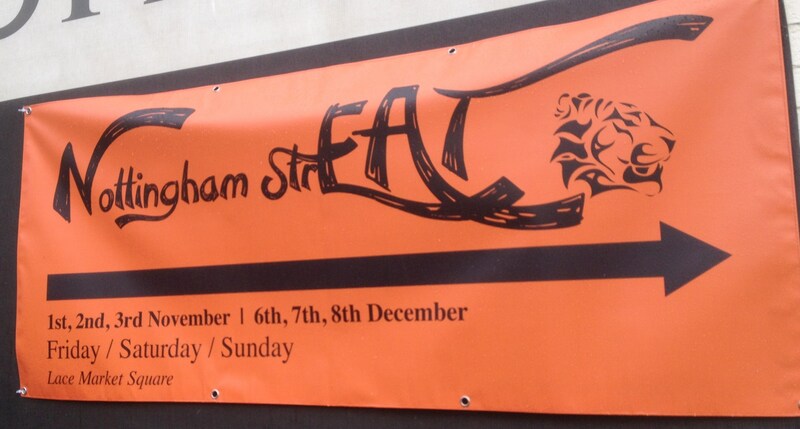 The StrEAT market is going to be reappearing each month with the next one being on the 6/7/8th December. In between you can try out the PureStreat market on the Friday. Every weekend i used to visit this web page, as i want enjoyment, since this this site conations actually good funny material too.